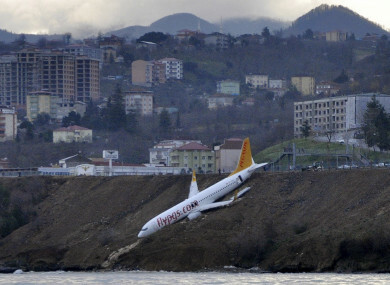 A Boeing 737-800 of Turkey's Pegasus Airlines after skidding off the runway downhill towards the sea at the airport in Trabzon. A PASSENGER PLANE skidded off the runway just metres away from the sea as it landed at an airport in northern Turkey last night, local media images showed. The cause of the incident was not known but an investigation is under way, the Trabzon governor’s office said. “We tilted to the side, the front was down while the plane’s rear was up. There was panic; people shouting, screaming,” she told state-run news agency Anadolu. The airport was temporarily shut before reopening this morning. Email “Turkish plane comes just metres from skidding into the sea”. Feedback on “Turkish plane comes just metres from skidding into the sea”.